Hi everyone! I’m excited to share with you this new feature I’m starting called Book Jar Recommendations (recs for short). What exactly does this mean? I was inspired by the idea of a TBR jar – you write down books you want to read on a scrap of paper and put them into a jar. For the Book Jar Recs, I’ll write down random themes or ideas on paper, put it into the jar, and once a week, pull one out and use that idea to recommend three books. Each idea/thought will only be one or two words so that I can be really flexible with how I interpret those ideas. Examples of ideas/things could be something like “2015”. For “2015” I could talk about a book published in 2015 or one I read in 2015, but not necessarily published that year. With the three books I’ll write a mini review and try to keep each one a paragraph or less. I hope to make this a weekly feature. What’s this weeks Book Jar Recs? Duologies! I’ve decided to talk about three books that are part of a duology. I hope you enjoy my recommendations and if you have any ideas I should put into the jar, let me know in the comments below. If you happen to read and enjoy one of my recommendations, I’d love to hear about it! Hartman presents us with a world where dragons and humans have been at war with each other for a long time. In the novel, the two have enjoyed 40 years of peace, but some would prefer war. Dragons can take human shape and act as ambassadors in the human court. The protagonist, Seraphina has a very dangerous secret – she is half-human half-dragon, which is something both dragons and humans forbid. I loved Hartman’s take on dragons – very logic-based, mathematical beings who don’t believe in emotions like love. It can actually be very deadly for a dragon to feel love. I also loved that Hartman gave Seraphina a gift for music and had her join the court – probably the worst place for a half-human half-dragon to be. Be sure to check out this fascinating take on dragons and its sequel Shadow Scale. I love sci-fi, particularly the space opera genre where there’s advanced technological devices and space travel is a very real thing. 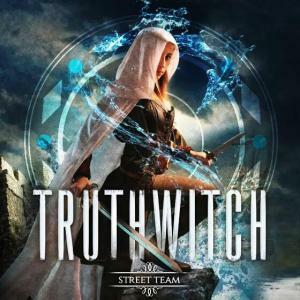 In Avalon, Jeth Seagrave and his group of teenage mercenaries make their living stealing metatech – devices that allow people to travel great distances faster than the speed of light. Jeth is constantly dreaming about that day when he can buy back his parents spaceship, Avalon from his boss and get himself and his sister, Lizzie, out of this crime-riddled world. Arnett gives us an interesting band of characters and I loved the references to the Arthurian legend of Avalon. This was an excellent addition to the YA space genre and great if you’re a fan of Sherrilyn Kenyon’s The League series, but want something in the Young Adult category. The sequel, Polaris is also currently available. So this is the sequel to Chanda’s Secrets, but I’ve decided to talk about it because in my opinion it can be read as a standalone (which I’ve done). I came across Stratton’s works through the Forest of Reading program and each time I’ve found him to capture very real-life, experiences and bring up deep emotions in the reader. In Chanda’s Wars, Chanda struggles to take care of her little brother and sister while avoiding General Mandiki, who steals children at night to turn into child soldiers. I read this back in high school and the way Stratton wrote about civil war, child soldiers, and hope still has me remembering it to this day. Hollywood Witch Hunter by Valerie Tejeda definitely took me for a few surprises. I originally wasn’t interested in this book when I heard ‘Hollywood’ in the title, thinking it’d show that pretentious side of Hollywood. I could not be more wrong! The world-building is fascinating, the protagonist incredible, and the satire comedy plus action combination a huge hit. I can describe Tejeda’s debut best as Buffy versus the Wicked Witch of the West, if a fight like that went down. This is likely my favourite part because Hollywood ended up being a perfect setting, so that shows here. Now, if this quote doesn’t make you immediately pick up HWH, keep reading my review. Tejeda has created an intriguing and diverse cast of characters. Iris Maria Bently comes from a long line of witch hunters and happens to be the first girl born with the witch hunting gene. When others tell Iris what she can and cannot do, she’s determined to prove them wrong. I love this aspect of her character, someone strong-willed and driven to prove her family and the Witch Hunting Organization (W.H.O.) wrong. Tejeda also illustrates big issues like sexism and discrimination through her character and I could really feel the raw emotion there. I myself became emotional at how unfair things were for Iris. Another character I love is Arlo, who recently found out he’s a Hunter and currently under Iris’ wing, learning about the business. I love that he’s a super sweet and shy person, and holds a deep respect for Iris as a peer and fellow Hunter. The two have this slow burning romance with each other, something I find really enjoyable. Then there’s Belinda, leader of the Hollywood witch coven and an overall hilarious character. Here’s where that satire comedy comes in: Hollywood cliches and general stereotypes are made blatantly obvious. Several decades ago, Belinda cast a curse on all female witches, forcing them to sacrifice young, beautiful women in order to maintain their youth. The more ‘Hollywood’ someone is, the better the sacrifice they make. HWH is very funny in that aspect, but also gets serious when needed. My favourite part is the world-building, and just how detailed and intricate it is. There are different types of witches, like Protas who can cast telepathic and telekinetic spells, and Matas who summon animals and insects. The Witch Hunting Organization (W.H.O.) is advanced, with Hunter Aviators that allow Hunters to cast Idas spells (forget me spell) and detect witches with thermal imaging. There’s also recovery shots, a concentrated Curas spell in liquid form, helping Hunters recover from big injuries. My ultimate favourite is Bruma, a witch fog seen only by Hunters, letting them know about recent witch activity. I found the first chapter really interesting, but I’m not sure what to make of it. It was mainly narrated, giving that back story of Iris discovering she’s a Hunter and proving to her father she should be on the team. I found myself enjoying it, but because of its format I felt like I shouldn’t. It did stand out among other books with how it introduced the protagonist and plot, and the back story was important to know. Hollywood Witch Hunter is a fantastic debut and I love the blurring of heroes and villains. Not everything is black and white, and that’s a significant lesson for Iris. I’m really good with figuring out foreshadowing so there are some revelations I saw coming. Overall, I strongly recommend this novel. It’s an original take on the witch genre with characters I won’t be forgetting anytime soon! I was gifted an ebook by the author. This has in no way altered my honest opinion of the book. 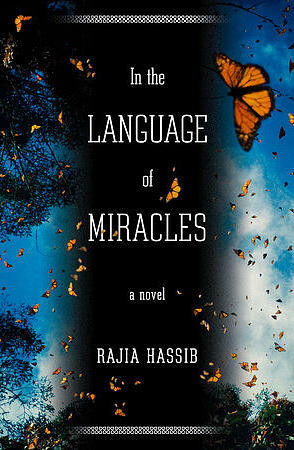 Today on the blog I’m sharing an interview I did with Rajia Hassib, author of In the Language of Miracles. I read and reviewed this book back in September and absolutely loved it! I definitely recommend it and you can read my detailed review here. Thank you Rajia for joining me today! AZ: For the readers, can you share a bit about your debut novel? RH: The novel is about the aftermath of a crime that the oldest son of an Egyptian-American family, the Al-Menshawys, commits. Set a year after the tragedy that leaves the son of the Al-Menshawys as well as the daughter of their next-door neighbors dead, the novel follows the lives of the family members as they negotiate their grief, guilt, and their place in a community that blames them for their son’s crime. In doing so, the novel tackles themes of identity, immigration, guilt by association, and religion, among other issues. AZ: What was your inspiration behind the novel? Why did you feel the Al-Menshawy’s story needed to be told? RH: The novel was a result of years of reflection on the cultural position of Muslims in the U.S. post 9/11. After Islam was used to justify such heinous terrorist attacks, I longed for Muslims to do something to rectify what I felt was a huge injustice done to my religion, but it was not until the Ground Zero Mosque controversy of 2010 that I realized how complex any attempt at redemption was. By then, I had become preoccupied with the idea of a public apology for something that one has not committed, so I decided to create a microcosm for that situation in the story of Al-Menshawys. I felt their story needed to be told because, on some level, it is the story of every American Muslim: how does it feel like when one’s own society starts viewing one with distrust and misgiving. As such, it was both a story that I longed to explore and that, in my opinion, was timely and much needed. AZ: In your novel, you’ve split the POV’s between Samir, Nagla, and Khaled. Why did you choose not to do one or more with Ehsan, the grandmother or Khaled’s sister, Fatima? Did you feel they had already found their miracle? 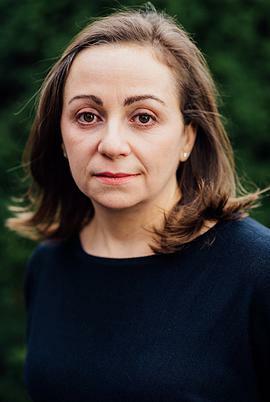 RH: I love how you view Fatima and Ehsan as ones who have already “found their miracle.” In a sense, yes: both those characters were relatively static, and, as such, did not undergo enough character development or experience enough internal struggle for me to feel that they need their own points of view. Fatima had found her peace in religion and in her friend, and she was certainly under less stress than Khaled was just because of how gender expectations and stereotypes make him an easier target for people’s suspicion. As for Ehsan—who, by the way, was one of the characters I enjoyed writing the most and, as such, one who has, in fact, tempted me to give her a point of view of her own—I didn’t feel her character experienced enough in the tight five-day period of the novel to justify giving her a separate point of view. She would have had a wonderful voice, I think, but her voice was not needed to move the plot forward, nor would it have given any insight that her presence in the separate section of Khaled and his parents did not already provide. At the end of the day, I did not feel the novel would have benefited from more than three points of view. AZ: I felt a sense of closure with the characters at the end, though different from what I think they were originally seeking. Do you think you’ll ever revisit these characters again? Has their story been told for now? RH: I’m glad to know you felt a sense of closure! I loved the time I spent with these characters, and I will confess that Ehsan in particular is a character I would have loved to write more about, but I do believe their story has been told. As interesting as I believe they are as individuals, I think their particular struggles are so closely tied to the tragedy of the son’s crime that revisiting them would shift the focus away from that and, in the process, dilute the intensity of their situation. If we were to compress their story in a sound bite, they would be the family who had to deal with the aftermath of dead son’s crime, and they need to remain mainly that. Besides, there are so many more stories to tell, so why keep on going back to the same characters? I’d rather leave readers wanting more than feel that my characters have overstayed their welcome. AZ: I loved reading the epigraphs in your novel. What was the idea behind this? RH: The epigraphs did not find their way to the novel until the second or third revision. I remember working on separate chapters and thinking about sayings or quotes that would go well with them, particularly because, in dialogue, Egyptians do quite often use sayings to comment on the ongoing situation. In some parts of the novel, I would imagine Ehsan uttering those sayings, and as I thought of the English translation to some of them, I started to realize that the exact same sayings do exist in the English language, either as an identical version or, in some cases, as a version only slightly different. I thought the similarities were just as telling as the differences were. I particularly loved the juxtapositions the sayings offer between Arabic and English and, by extension, between the cultures that each language represents. So I started including them as chapter heading both to offer commentary on the chapters and to underscore the various themes the novel deals with. AZ: You completed a BA in Architecture before getting a degree in English a decade later. What prompted this decision? Did an early draft or an idea for In the Language of Miracles exist around this time? RH: I had always wanted to study English literature. In fact, I had decided on majoring in English at some point in high school. Once I had to choose my major, however, I went with architecture (which I also loved but which was always second to English) because it was the more practical field of study for someone living in Egypt and, to be honest, because my father talked me into it. I was eighteen and a very obedient daughter! In hindsight, I’m glad things happened the way they did, because missing out on studying English that first time was the main reason I was so determined to do it once I moved to the U.S. So I went back to school, earned a B.A. in English and then an M.A. in English with a creative writing emphasis, both from Marshall University. In the Language of Miracles first started as an idea for a short story during my last semester as an undergraduate student at Marshall, and I completed the first couple of drafts of the novel during my graduate studies. An earlier version of the novel was my creative thesis for the M.A. in English. So that particular novel did not exist before that, but the urge and need to write dates back to my childhood years. I distinctly remember walking up to my parents at some point during the summer between first and second grade and announcing that I would become a writer. It took me three decades to get there, but better late than never! AZ: Can you tell us about your experience with publishing In the Language of Miracles? Any advice you’d like to share with aspiring writers? RH: I can honestly say that I had an extremely positive experience with publishing In the Language of Miracles, but I would also have to say that I got very, very lucky. Through a series of events too elaborate to narrate here, I ended up being represented by Lynn Nesbit, a powerhouse of a literary agent who represents, among others, writers such as Ann Beattie, Joan Didion, and Jeffery Eugenides, and then the novel got picked up by Allison Lorentzen, a well-respected senior editor at Viking and the force behind a breathtakingly impressive list of books. I had never before given much thought to the publishing business—I was too busy learning how to write a novel to have time for that—but I now know that the publishing experience is quite emotional and personal, especially for a first time author. As such, I feel blessed to be working with an agent and an editor for whom I have the greatest respect and admiration, and, more importantly, with whom I’m quite comfortable. They are the reason I view my publishing experience in such positive light. As for advice for aspiring writers, I only have this to offer: read a lot, write a lot, and treat your writing—and your future readers—with respect. Put in the time and effort required to make your draft as good as you can possibly make it. That way, if you get as lucky as I did and find your draft in the hands of the agent and editor of your dreams, the work will hopefully show and you will prove yourself professional enough to be worthy of their time and attention. AZ: Can you tell us about any projects you’re working on? RH: I’m currently working on a novel set partly in Egypt and partly in the U.S. The novel takes places in the aftermath of the 2011 Egyptian revolution, and it follows the lives of three different characters as their paths intertwine and finally merge. I hesitate to talk in detail about a work in progress, but I can share this: There is a marriage on the brink, the found diary of a long-dead mother, and a young man who yields the destructive power of one who has lost all hope. It is an intimate, complex, and passionate story, one that I’m enjoying writing very much and that I hope readers will enjoy, too. I was born and raised in Alexandria, Egypt, before moving to the US at age twenty-three. A decade later, I returned to college to study English Writing and Literature and to pursue my life-long dream of becoming a writer. I hold a BA and an MA in English, both from Marshall University. After graduation, I worked briefly as a part-time Instructor of English at Marshall University, teaching an Introduction to Creative Writing class as well as a class on Postcolonial Literature. I live in Charleston, WV with my husband and two children. Visit her website. I hold a BA in Architecture from the University of Alexandria, Egypt. While I was earning my BA in English from Marshall University, I lived 88 miles away from campus and commuted two to three times per week in order to finish the required coursework. While I was earning my MA, I moved to Charleston, WV, and my commute got shortened to 55 miles. I learned German before I learned English, and was, during my teenage years, more fluent in German than English. Not any more, though. Speaking of German: I went to a school run by German nuns from Pre-K until I graduated high school. I give full credit to the nuns for instilling a compulsive sense of discipline in me, which, unfortunately, only extends to the professional aspects of my life. Everywhere else, chaos reigns. I have half a shelf in my office dedicated to discarded versions of In the Language of Miracles, all of which I wrote while I was earning my MA and working as a Graduate Teaching Assistant. And yes, I’m so proud of this fact that it earned its own bullet point on this list. Lydia is dead. But they don’t know this yet . . . So begins this debut novel about a mixed-race family living in 1970s Ohio and the tragedy that will either be their undoing or their salvation. Lydia is the favorite child of Marilyn and James Lee; their middle daughter, a girl who inherited her mother’s bright blue eyes and her father’s jet-black hair. Her parents are determined that Lydia will fulfill the dreams they were unable to pursue—in Marilyn’s case that her daughter become a doctor rather than a homemaker, in James’s case that Lydia be popular at school, a girl with a busy social life and the center of every party. Everything I Never Told You by Celeste Ng is an emotionally-gripping debut. Absolutely breathtaking! I haven’t read so much emotion in a book since Saint Anything (read in May 2015). Interestingly enough, both books are similar in the theme of teens not having their voices heard, but still very different in the story told. Ng makes the smooth transition from present to past to present; the same is true for the changing POV’s. She brings out empathy in the reader and I found myself appreciating the privilege I have. I found myself asking why did the author decide to start the novel in this way? From the summary this isn’t a spoiler, the reader for the most part goes into the novel knowing Lydia is dead (though not how or why). Still, the reader doesn’t find out about this death like the Lee family. I came to the conclusion that perhaps Ng wants the reader to focus on how the family got to this point. How and why did this happen; could it have been prevented? As I progressed into the novel, I found that Lydia’s death was the climatic point of this family’s story, even though the reader only knows their story from the point of her death onwards. Lydia is the centre of her family’s universe, holding them together as well as shouldering a great burden. The POV’s change between Marilyn, James, Nath, Hannah, and briefly Lydia. The reader lives through the summer of 1977 as well as past memories of the Lee family. This also made Lydia’s death the pivotal point that much more certain to me. Marilyn has always wanted to be a doctor but ends up a homemaker, the thing her mother felt most important to achieve and something Marilyn hated the most. James grew up without friends, never fitting in anywhere. Both parents try to live their dreams through Lydia – becoming a doctor and being popular in school. Nath loves space but finds it frustrating to get the attention away from Lydia and onto him. He’s counting down the minutes until he leaves for college in the fall. Lydia dreads this moment; she feels like Nath is the only one who truly understands her feelings. Hannah is a ghost, the child always forgotten, but also someone who notices everything. From my impression of the synopsis I expected Lydia to actually be popular with lots of friends, which wasn’t the case here. She’s surrounded by loneliness; the frustration of not being heard is slowly building up. I would have liked more POV’s with Hannah, something I expected going into this novel. In a way, this fits with that ghostly image of Hannah, but I did think this novel would centre around her – the forgotten child. Something interesting to add, I found the writing would talk about a character/place/action as if the reader were a small child looking in on a family of dolls in a dollhouse (the Lee family being the dolls). An out-of-body experience. I find Ng’s writing extraordinary in that matter. Sometimes I even felt like a ghost embodied the pages – perhaps Lydia, who while not physically present in summer 1977, remains as a ghostly presence till the story’s end. There are so many messages that can be taken from Everything I Never Told You: empathy, damaging stereotypes, suicide, teens not being heard, grief. Whether this is a book you might or might not usually read, Ng has the ability to draw you in. A powerfully moving story. It’s so enthralling that just thinking about the ending while writing this review brings back those emotions. I’m a little late getting this post out, but better late than never. 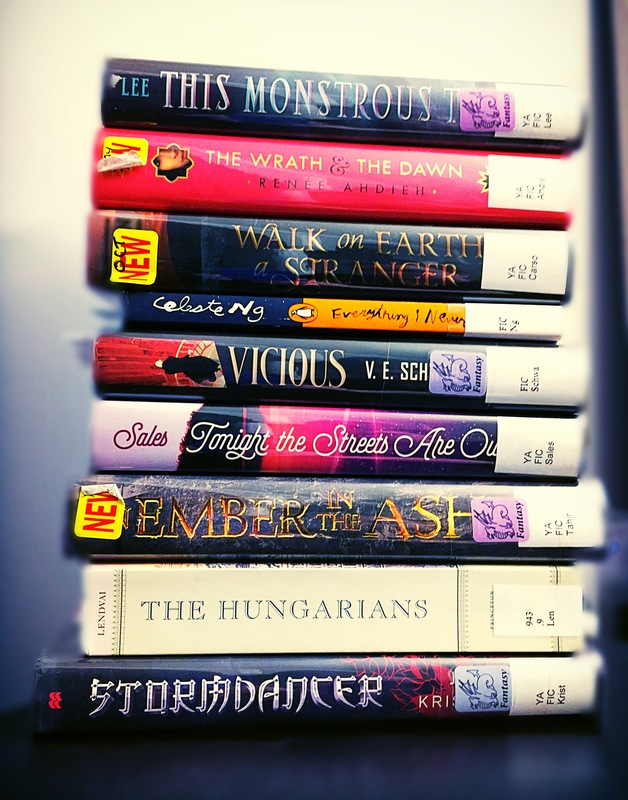 Last month, I talked about cutting down on my to-be-read pile so that when the new year comes around, I won’t feel guilty about starting all those amazing 2016 releases. Can you believe there’s only two months left of 2015?! A little recap, last month I decided to focus on books I’d bought or received in September. I ended up reading four out of the ten books I’d listed and since I like to think of myself as a glass half-full type of person, I’m happy about that accomplishment. I read six books in total so October was a good reading month for me. I’ve already started Everything I Never Told You which is really great so far and I’m excited to read The Martian because I’ve heard only good things and the movie was amazing! Has anyone read any of these? What did you think? If anyone’s read The Martian and seen the movie, how did you like them? I’m curious to know how the book and movie compare. This was a hard review to write. I wanted to like Fire Falling more than I did. I love these sorts of fantasy worlds, but the writing style wasn’t for me. This is the sequel to Air Awakens and though I did like the writing better here, there were still the same underlying issues that had me struggling to get through Air Awakens. I don’t particularly like the writing. The author’s vision wasn’t translated for me and I’m sure if that wasn’t the case, I would have loved Fire Falling. For the most part, my issue was with things like sentence structure, word choice, and tense. When I read Air Awakens, I’d also felt like the writing switched between telling and showing, so I’m glad that wasn’t the case here. However, that experience was in the back of mind while reading Fire Falling, almost like some watermark left on the pages. Funny enough, I feel like if I’d never read Air Awakens but went straight to Fire Falling, the writing wouldn’t have bothered me as much. I’d be totally confused in the beginning and be spoiled for book #1, but enjoying the writing totally outweighs that. When it came to the characters, I disliked most of them. I couldn’t connect with many of them or sense any sort of character development. I did enjoy Vhalla’s companions, Larel and Fritz and gained an in-depth sense of their personalities. The three of them becoming close friends was probably the only clear thing to me character-wise. In addition, the reader is introduced to a new character, Elecia and it’s understood she has some sort of romantic past with Aldrik. I hated that she’s presented with this stereotype: the automatic rival of Vhalla because she did or still does have a romantic relationship with Aldrik, Vhalla’s love interest. It makes me think of a high school-set novel [mean cheerleader because she has the attention of the popular guy aka protagonist’s crush] and I hated that. Out of all the possible stereotypes out there, I loath that one the most. There were a couple of things I loved about Fire Falling. The reader gains a deeper experience of the magic that makes up this world. It was really interesting learning about things like Channeling, the Bond Vhalla and Aldrik have, and Projection. I also loved the way Kova describes certain settings and the different landscapes that make up this world. I stopped reading Fire Falling at 59% because at that point, I didn’t get any sense of a plot or a definite antagonist. I understood there were a couple of political figures who want Vhalla dead and the Emperor wants to use her as a pawn, but neither of them came off as the antagonist I was hoping to read. Additionally, I needed a plot that goes further than Vhalla understanding herself as a Windwalker and the South trying to win the war. I haven’t fully decided whether I’ll be continuing the series. Like I said, I actually love the fantasy world Kova’s created and on the surface, I should love the characters, but it all comes down to the writing style. My reading experience didn’t give me a clear idea of what the author tried to get across to the reader. If you liked Air Awakens I recommend Fire Falling. If you were like me and really struggled with Air Awakens, then maybe this series isn’t for you. I received an eARC from the author in exchange for an honest review. This has in no way altered my honest opinion of the book. There’s also a giveaway to win a signed hardcopy of Fire Falling! Be sure to enter!